I know I’ve mentioned our love of our bimini, decrepit as it is, way back when we were motoring around in the Erie Canal. Now that we’re in the tropical sun, shade has become an even more pressing issue for us. Mid-day on our passage to Panama was not relaxing–we were all huddled under the sliver of shade from the bimini, with the rest of the cockpit abandoned to the blazing heat. No longer. We’ve spent a few extra days in Portobelo, getting some work done on our canvas. 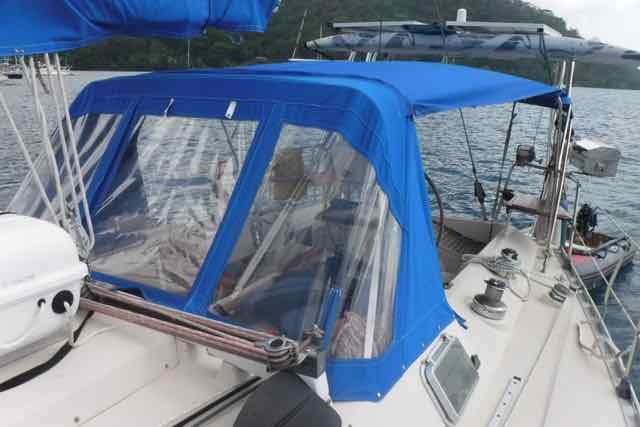 Thanks to Ray at Casa Vela, we’re better set for the upcoming San Blas islands. Huge upgrade. The cell data situation here in Panama is, shall we say, less than optimal; you might not be hearing from us for a bit. Expect great things in a few weeks. got some pics of your boat (Sapphire) in panama canal if interested? We’d love some pics of Sapphire! You can email them to sailingmilou at gmail dot com. Thanks! money well spent as we all love the sun just not on us and it looks like a nice top, good luck in your continued travels, I look forward to turning the pages to your next venture…..
You continue to amaze me with your flexibility and intrepid spirits. You will all be certifiable as diplomats when you return to land living. Spring is springing here with a vengeance, and the Snow Queen’s about to burst. Got a surprise “tan” myself, just on a short bike ride. So, glad to hear of your bimini’s revamp. High fives to all the Team. We miss you.